REGISTRATION IS NOW CLOSED FOR 2016! Welcome to the 8th Annual Paris Spelling Bee (PSB). Registration for the 2016 Bee opens on December 1, 2015. The event is open to English-speaking students currently in CM1-6ème (4th-6th grade). Click here to download the registration form. Please also visit the 2016 Invitation, FAQs and Registration Form pages on our blog. Here are some important dates for your 2015-2016 calendar. Saturday December 5, 2015 — Language Comes to Life : 12h00-13h30, at The American Library in Paris (ALP). For ages 8-12. Come join the Paris Spelling Bee team and have fun learning prefixes and suffixes, guaranteed to help you unlock some of the mysteries of the English language! Space limited to 12 children. To RSVP, please email Celeste, ALP’s youth librarian at rhoads@americanlibraryinparis.org. Saturday January 9, 2016 — PSB Family Pizza & Movie Night: 19h00-21h30, to be held at the ALP. Join us for the annual screening of the movie Akeelah and the Bee. Pizza and refreshments will be provided by the ALP. Click here to reserve your spot. RSVP is mandatory. Space is limited to 80 people. Deadline is January 5. 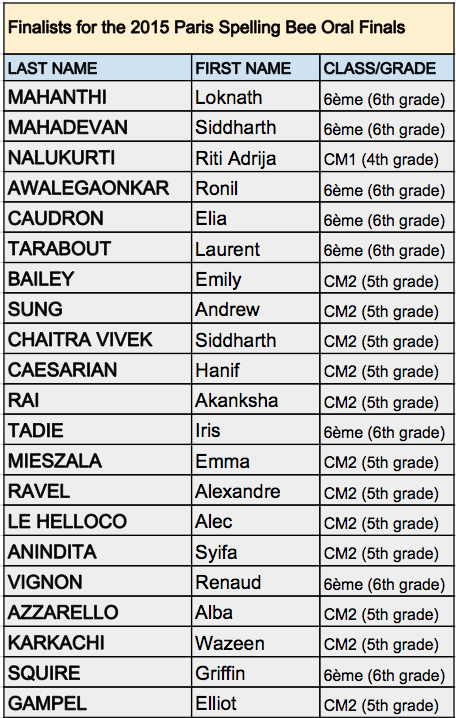 Tuesday December 1, 2015 — Paris Spelling Bee Registration Opens for children in CM1-6ème. The Registration Form can be downloaded from our How to Register page. The form will also be mailed to schools, community leaders and parents. The Registration sheet must be returned by mail to the address indicated on the form along with the participation fee. We do not accept electronic registrations. Wednesday January 13, 2016 — Registration Deadline!! Forms must be postmarked on or before January 13. Registration is first come first-served, and limited to about 80 applicants. To add your name or your school’s contact information to our updates, please use our Contact page. Saturday January 30, 2016 — PSB Written Preliminary Round –– For registered participants. Tentative time is 09h30-12h30. The location, in the 5th arrondissement, will be provided to registered participants at a later time. Twenty finalists will be chosen to advance to the Oral Finals, which will be held on March 20. A Study Guide for the 2016 Preliminary Written Round has been posted on our Study Guide page as of December 1, 2015, and will be emailed to registered participants. The Preliminary Written Round consists of about 35 words, most of which will be drawn from this Study Guide. Additionally, there will be some surprise words in the written test. Sunday February 14, 2016 — PSB Mock/Practice Session — Tentative time: 10h00-12h00: This event is organized for finalists chosen from the January 30 Preliminary Written Round. The Mock Bee (practice session) will be held at the American Library in Paris. 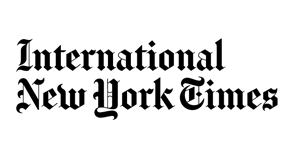 A separate Study Guide for the Oral Final Round of the Paris Spelling Bee will be made available to finalists after the Preliminary Written Round. Sunday March 20, 2016 — Oral Final Round of the Paris Spelling Bee — Tentative time is 09H00-12h30. This event is open to finalists and their invited guests and will be held at the The American Library in Paris. To sign up for PSB updates and registration information, or if you have questions about the Paris Spelling Bee, please email Helen Sahin Connelly through our Contact page. The Paris Spelling Bee is organized by Gifted in France, a non-profit association loi 1901, in collaboration with the The American Library in Paris and with the support of AAWE. PSB is grateful to the ALP for its continued support of this community-wide enrichment event open to children throughout Paris. In the 2015 Paris Spelling Bee, 72 children in grades CM1-6ème (4th-6th grade) from over 35 schools, including 20 public schools, participated in the Preliminary Written Round. Twenty one students advanced to the Oral Final Round on March 20. For more information about the 2015 Bee, please scroll down on this page. Best of luck to everyone entering 2016 Bee. We are happy to be back for our 8th season!